Over-the-counter diet pills are advertised with frequency on TV, enticing viewers to buy these products as a way to easy weight loss. Many of these products make unsubstantiated claims, however. There is only one OTC diet pill, orlistat, that is approved by the U.S. Food and Drug Administration for weight loss. Because of the varying levels of available scientific evidence, it is difficult to compare OTC diet pills to prescription weight loss medications such as phentermine. There are two kinds of diet pills: those sold over the counter as weight loss supplements and those available only by prescription. Orlistat is a weight loss pill that can be purchased at higher doses with a prescription, though it is also sold over-the-counter in lower doses. Other products sold without a prescription are considered weight loss supplements and are not regulated by the FDA. Phentermine is an FDA-approved prescription weight loss medication and should only be taken under a doctor's supervised care. Orlistat is marketed over the counter under the brand name Alli. At 60 mg, it is half the strength of its prescription counterparts, according to Drugs.com. Often called a "fat blocker," this medication works by preventing the body from absorbing all of the fat you eat. Dietary changes are required to avoid unpleasant side effects caused by the excretion of excess fat through the bowel. Exercise is also recommend as part of an overall weight loss plan that includes orlistat. According to Drugs.com, phentermine is a stimulant similar to amphetamine. It suppresses the appetite by directly affecting the central nervous system. Phentermine is a drug of abuse and can be addictive. It is important that phentermine be taken as directed; it should never be stopped suddenly. According to ConsumerSearch.com, evidence to support the use of most OTC diet pills is seriously lacking. Therefore, it is difficult to make a comparison between these unregulated supplements and proven medications such as orlistat and phentermine. Phentermine and orlistat are cited by MayoClinic.com as helpful tools in the effort to lose weight, but only if your body mass index is greater than 30, or greater than 27 if you have serious medical conditions associated with obesity. Many people regain weight once they stop taking these medications; that's why diet and exercise are prescribed by doctors along with weight loss medications. DiabeticLifestyle.com reports that in 4,000 patients, orlistat helped them lose 10 percent of their body weight over the course of a year. Orlistat is the only weight loss medication approved for such long-term use. Because the FDA approves phentermine only for short-term use, it is difficult to compare its effectiveness with orlistat. 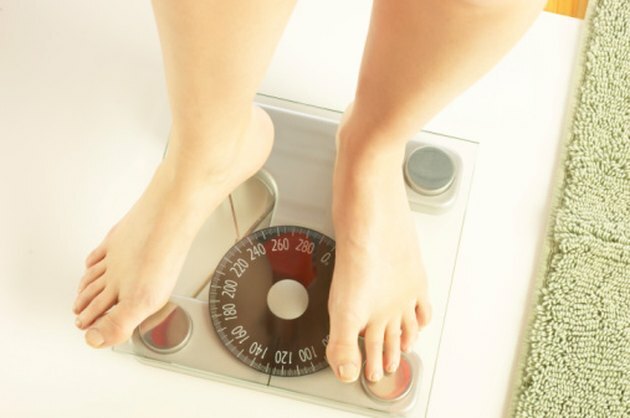 DiabeticLifestyle.com notes that phentermine studies showed an average weight loss of 6.6 lbs. in patients using phentermine for 20 weeks or less. In 2007, the Federal Trade Commission fined the makers of several OTC diet supplements $25 million for making advertising claims not backed by scientific evidence. In 2009, the FDA issued a warning regarding 72 OTC diet pills because of undeclared ingredients that could lead to high blood pressure, seizures or stroke. Some products have been pulled off of the market as a result. Over-the-counter versions of orlistat are considered generally safe. Still, this drug is under investigation by the FDA because of reports of serious liver damage; these reports are rare, however. Always consult a physician before using OTC orlistat. Taking phentermine with other diet medications can cause a fatal lung disorder called pulmonary hypertension. If you have coronary artery disease, high blood pressure, overactive thyroid, glaucoma, a history of drug or alcohol abuse or are allergic to other diet pills, amphetamines, stimulants or cold medications you should not take this medication.